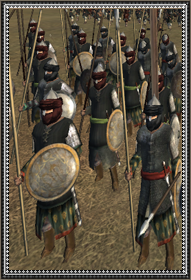 Beyond weaponry, beyond circumstance, beyond individual martial skill or that of their whole, it was the motivation and courage possessed by the ranks of the faithful which led their victories over the pagan Meccans and fellow Arabs under Muhammad, and much of the known world under the Rashidun Caliphs. This passion to serve as they saw God's will took men of only a nomad's discipline to battle and best the mighty nations of Persia and Rome, and would remain instilled however deep and buried in the hearts of all who practiced the one true faith./n/nThe will of God and passage of time has seen for the decline of the Caliph's might at the hand of more secular and aristocratic regime's rises, with those driven by faith lying in slumber while men delivered to the fields of battle by greed, vain glory, or obedience to mortals take to the ranks of the Dar al-Islam's armies. At last, with the shock of the Frank's invasions of the Holy Lands rousing the sleeping lion of Islam to a vengeful alertness has drawn upon the horn to call the faithful to battle./n/nWhile many religious volunteers come bursting of faith but with little discipline and tools from which to achieve God's desires, the ranks of the Mutatawwi'a swell with veterans of battling infidel, heretic, or even fellow Muslim. Those who can afford mail, lamellar and quilted armor, who come into possession of stout iron-skinned shield and sturdy spear, form brotherhoods which ply their service for any pious Muslim ruler. Valuable men these are, motivated as well as their are adorned and armed, willing to pursue the will of the Almighty nothing short of victory or their own demise. Silk Road Caravan stop encourages and accomodates the merchants trading on the lucrative silk route. Silk Road Caravan stop expands existing silk road trading hubs to meet with the ever-growing demands for far-eastern goods.